Magnetic resonance imaging (MRI) scanning to detect cancers. 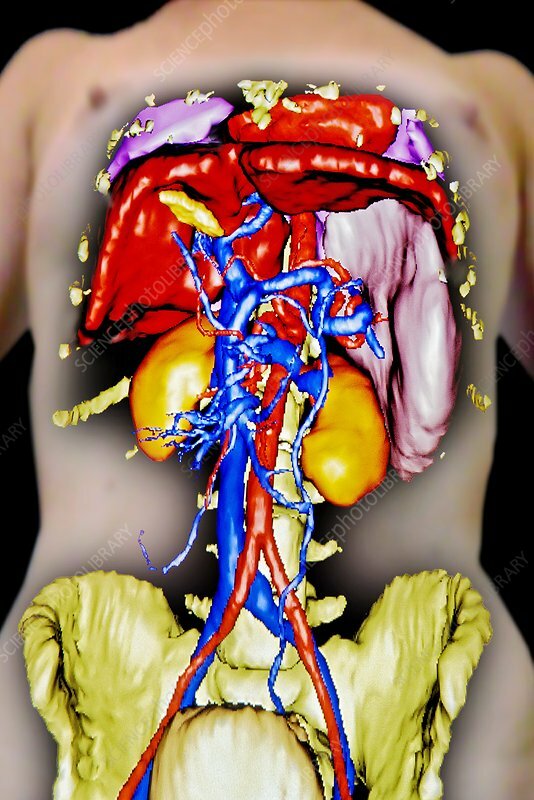 This frontal 3D MRI scan shows several of the body's internal organs. The pelvis (green/yellow) is at bottom, and the body's main artery (red) and vein (blue) are at centre, along with the kidneys (orange). Parts of the spine, ribs and other abdominal and chest organs are also seen. This is an advanced scanning program that can distinguish different tissues in a level of detail high enough to detect small, local tumours. This scan was produced at IRCAD, the French research institute for digestive system cancers, in Strasbourg, France.